Our avocado deviled eggs are light and refreshing and a great kid friendly recipe to get kids into the kitchen. 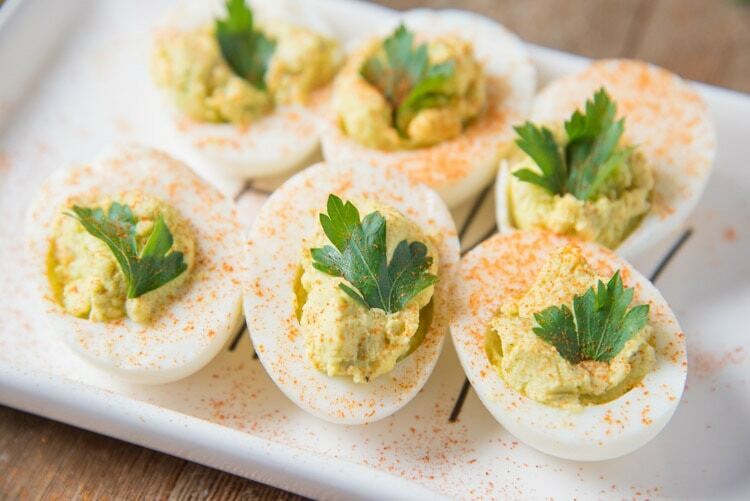 Everyone loves these healthy avocado deviled eggs, a twist on a traditional recipe. 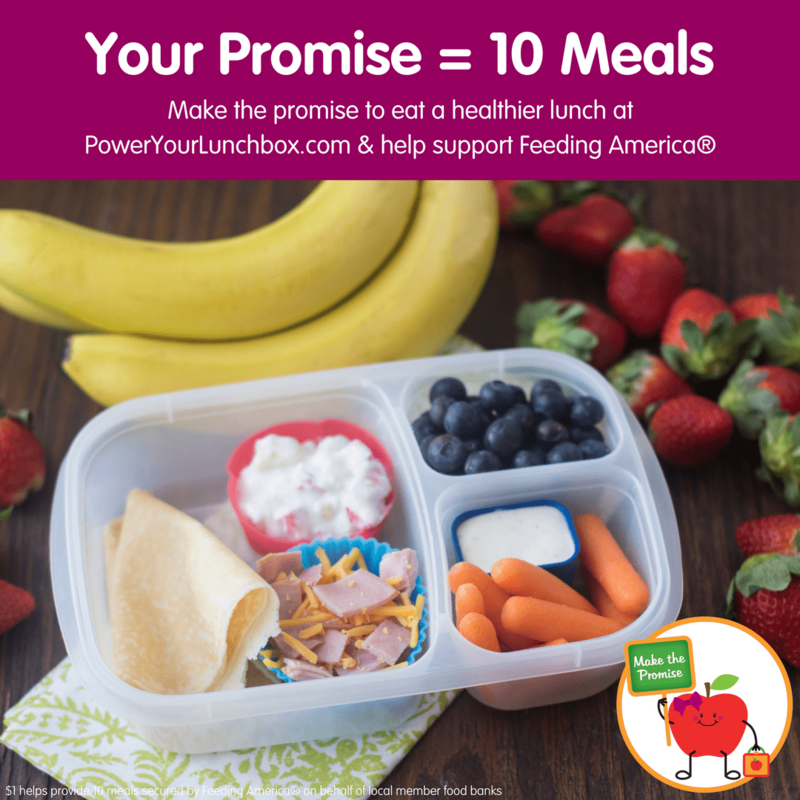 We’re excited to be partnering with Produce For Kids again this year for the Power you LunchBox Pledge! If I made traditional deviled eggs my daughter would refuse them. She loves egg yolks, but once you put mustard and mayo into it she won’t touch it. 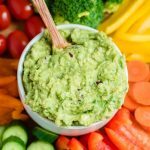 Since she loves avocados we tried it once and she has loved it since! 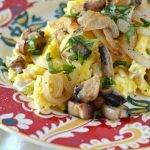 We’ve changed the way we make it over time since she likes more seasonings like granulated onion and more lemon. I never knew I’d have a kid that loves tart flavors, she can enjoy tart just as much as another kid enjoys sweet. as we made this she would like the lemon after squeezing. If you don’t like paprika on deviled eggs you can absolutely keep it off. 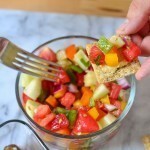 We like using paprika to add some color and our mini chef loves to sprinkle it on too! When we make deviled eggs with avocado we also pair it with some lemon and parsley. Raw onion can have a bit of a bite to it, so to keep it kid friendly we use granulated onion. Whenever we make hard boiled eggs our daughter comes running asking to make avocado deviled eggs no mayo! She’s not a fan of mayo unless it is in a salad with pasta, don’t even put it on a sandwich or she’ll find it. Our avocado deviled eggs are great for kids lunch boxes too! We use no liquids aside from lemon juice, this results in a fresh and slightly tart flavor. 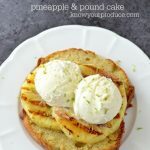 If you want you could use lime instead of lemon. 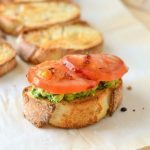 When you use the lemon or lime it prevents the avocado from browning. 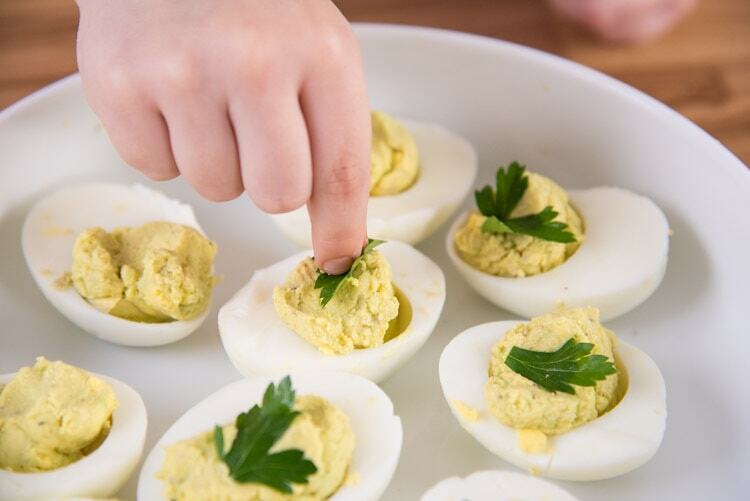 Deviled Avocado Eggs are easy to make and you can even let the kids help! Simply hard boil or steam your eggs (how to: steamed hard boiled eggs) and then once their fully done peel the shells. Once the shells are removed you can cut the eggs in half and remove the yolks. We mix the yolks with lemon, avocado, granulated onion, salt, and pepper. 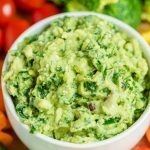 When using avocados for recipes we always suggest using Avocados from Mexico. They’re creamier and usually the most reliable in our experience. Deviled eggs are hard boiled eggs that have been removed from their shells, cut in half, and then filled with a filling made with the egg yolks. Traditional deviled eggs have mustard, mayo, and sometimes relish. 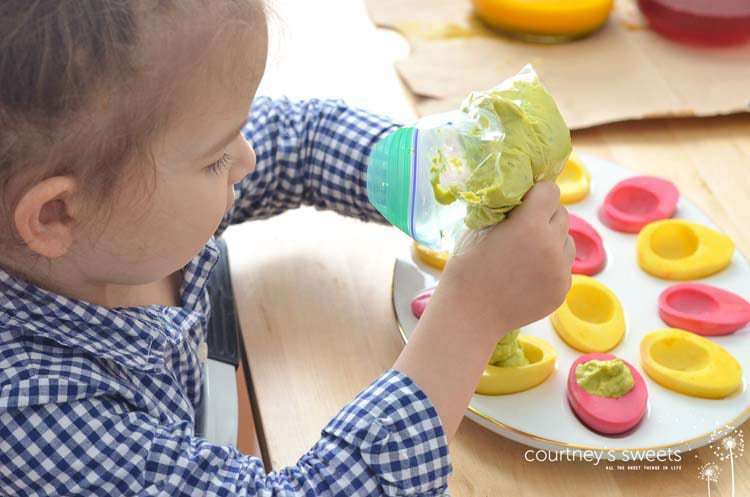 You can make these Avocado Deviled Eggs simple or FUN for kids! We love to dye our hard boiled eggs using real foods. Check out How to Natural Dye Eggs using produce! 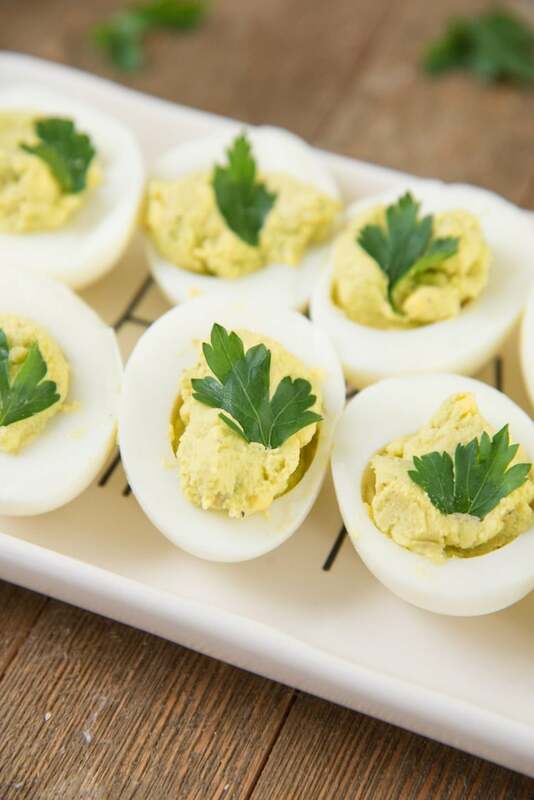 We made this Avocado Deviled Egg Recipe for the Power Your Lunchbox Pledge. We’re excited to be partnering with Produce For Kids again this year. 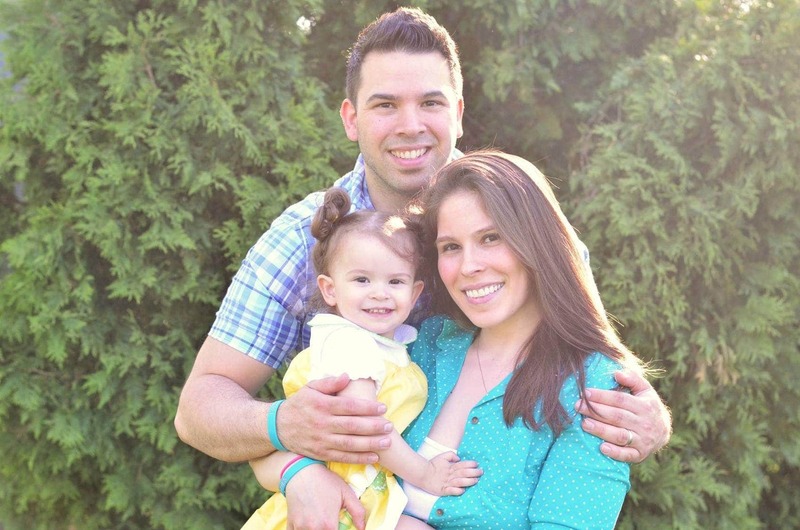 For every promise made a $1 will be donated to Feeding America to help families in need. Share you Lunch Box Pledge by using #PowerYourLunchBox on social media and make the promise here. This pledge will be over on February 17, 2018. 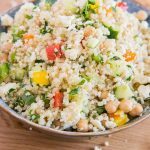 Thanks to the following Power Your Lunchbox sponsors; Avocados from Mexico – Mexican Hass Avocados, Bee Sweet Citrus, Crispy Fruit Freeze-Dried Fruit Snacks from Crispy Green®, Earthbound Farm® Baby Kale, Pero Family Farms® Mini Sweet Peppers, Snipped Green Beans and Organic Snipped Green Beans, and Wish Farms Strawberries. 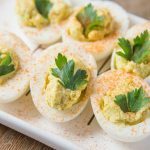 Our avocado deviled eggs are light and refreshing and a great kid friendly recipe to get kids into the kitchen. 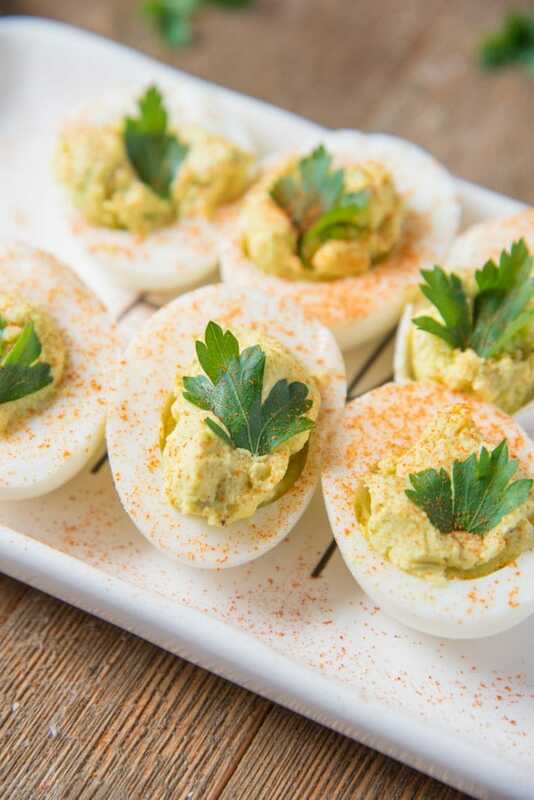 Everyone loves these healthy avocado deviled eggs, a twist on a traditional recipe. Slice the eggs in half and remove the yolks. 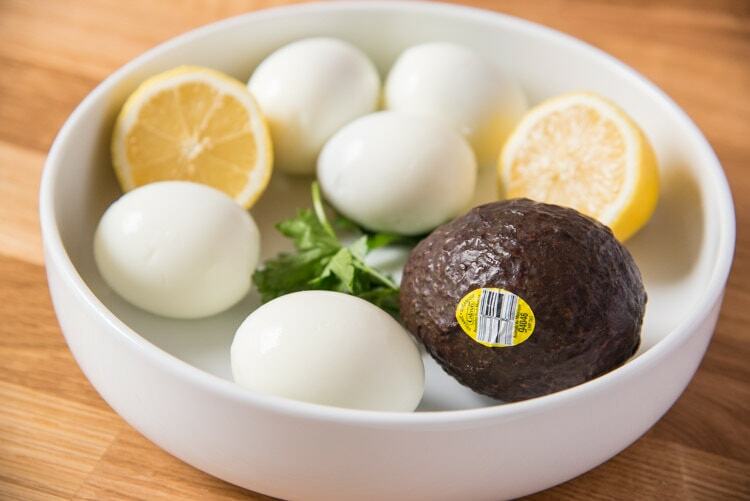 Place the egg yolks into a large bowl and mix with the avocado, lemon juice, and seasonings. Scoop the mixture into the eggs, or use a piping bag to pipe back into the egg whites. 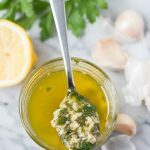 Serve garnished with some paprika and fresh parsley. The nutrition information shown is an estimate provided by an online nutrition calculator. This should not be considered a substitute for a professional nutritionist’s advice. Please read our full nutrition disclaimer for more info.